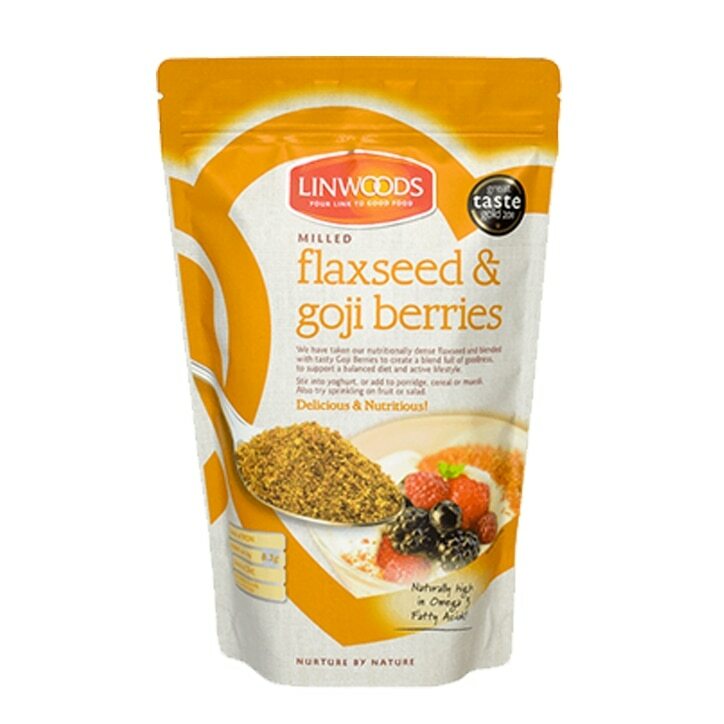 Linwoods have taken their nutritionally dense flaxseed and blended it with tasty Goji Berries to support a balanced diet and active lifestyle. Flaxseed is one of nature?s richest sources of the essential fatty acid Omega 3 (ALA) which we must get from our food. Stir into yoghurt, or add to porridge, cereal or muesli. Also try sprinkling on fruit or salad. We recommend each person takes 25-30g = two heaped dessert spoonfuls daily. Linwoods Milled Flaxseed & Goji Berries is rated 4.9 out of 5 by 15. Rated 4 out of 5 by DiDi123 from Great sprinkle I have used this for a couple of years as a sprinkle on my breakfast cereal. Rated 5 out of 5 by Iris24 from Loved this added to my porridge! Great product to boost my day with. I added it to my porridge along with cinnamon, sultanas and nutmeg and a little Manuka Honey. Rated 5 out of 5 by MartyLB from Great taste I add a couple of tablespoons of this to my breakfast, adds a lovely flavor to any cereal and gives you all the added bonuses of omega oils.